Crowns were obviously signs of rank and status and were most prevelant among the Yoruba of Nigeria. 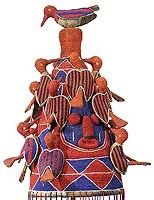 Traditionally, Yoruba crowns were worn by the king, or Oba, in public ceremonies. They were embellished with symbolic designs in beads which were themselves signs of wealth and status. Most of our Yoruba crowns are contemporary and were probably made for sale rather than for use by a king. There is some merging of usage with other African crowns with helmets, which were largly ceremonial, denoting rank and status, rather than functional in a military sense.